It's October (can you believe it…) And that means it's time for Clearly Besotted Stamps Teaser Time. I gave my reindeer lovely shiny Glossy Accents noses. OK, that's it for today. But head over to Stephanie's blog and find links to the other DT projects. I'll be back tomorrow with my second sneak. I've just seen Stephanie's cards using these new balloon stamps and I'm finding them irresistible. It's great to see you can also use them without the balloon thingy. Adding the wobbler is such a cute idea. The wobbler adds the WOW factor, but it is such a perfect image for Christmas in the first place, lovely card! I have to have these. Thank you, Lucy, for dipping into my wallet...aagain. So, so cute!!! Very creative....love the wobble and the glazed noses. Oh my gosh! 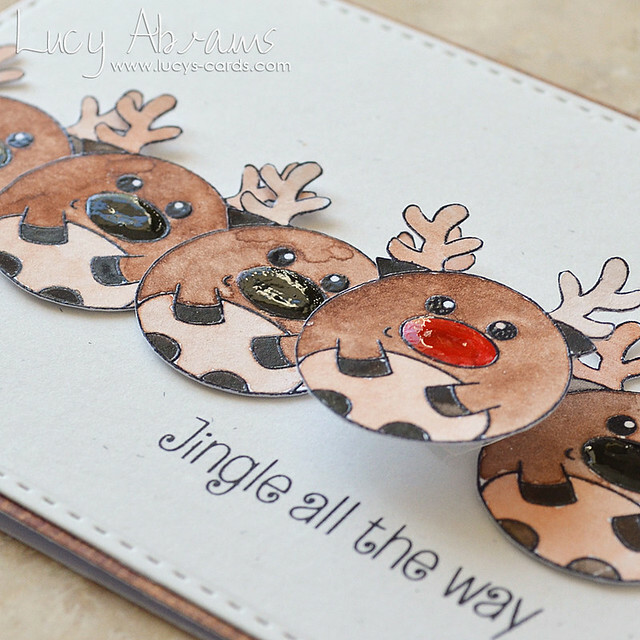 How adorable is this card with the wobbly reindeer! Another item added to my ever-expanding CB list!